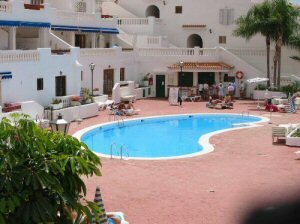 Port Royale is a quiet, well maintained complex built in Andalucian style, which sits on the hillside overlooking the charming resort of Los Cristianos. It does not suffer from the late night noise problems that can so often ruin your holiday. There is a swimming pool (heated in Winter) with sun loungers and umbrellas, gardens, laundry room and an Italian restaurant on site. A well stocked supermarket is close by, with the beach and centre of Los Cristianos a mere 20 min stroll away. The reception provides internet, books, car hire, excursions and more. This complex is kept to a very high standard and is especially suitable for families. There is a laundrette on site. Los Cristianos was originally a small fishing village on the south coast of Tenerife and still has some lovely fish restaurants. Now a busy resort it has maintained it’s 'heart' has the ideal climate for a holiday all the year round. There are several beautiful beaches and a wide variety of shops, bars and restaurants nearby, as well as golf courses and a Sunday market. It is the ideal base to explore both the coast and interior of Tenerife. The complex is 30 minutes from Mount Teide and Loro Parque.